"Chichibu" is a small valley in the western part of Saitama prefecture renowned for its rich and varied historical and cultural heritage, historical sites from the old stone age era to the Warring States period (1467-1568), ancient burial mounds, Japanse copper coins, Chichibu Okan (highway), the Chichibu incident (1884), the Chichibu pilgrimage circuit, and the Chichibu Night Festival. Chichibu is an idyllic destination popular among city folk, especially for the beauty of its changing seasons. About 80 minutes by train or 90 minutes by car from central Tokyo. See the Access page for details. 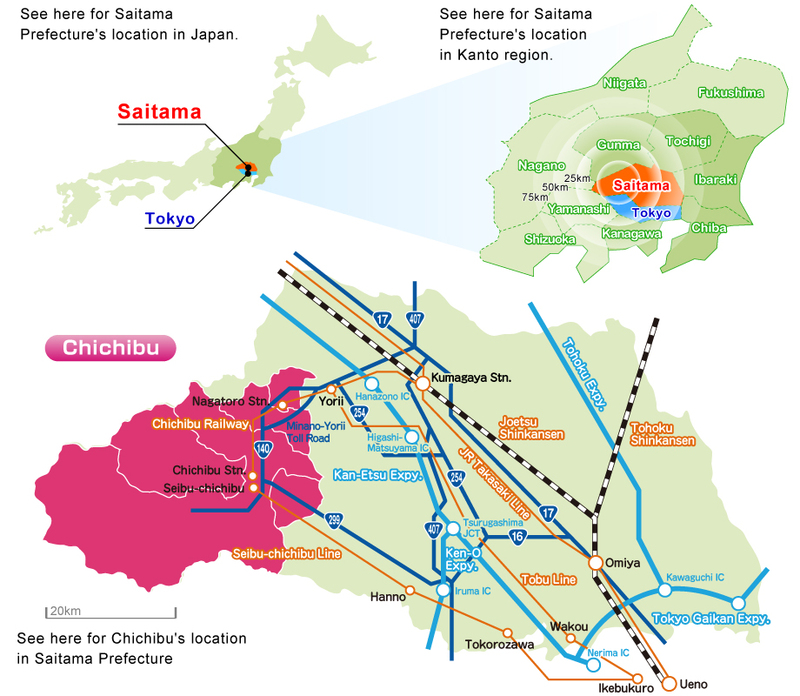 Omotenashi Tourism provides tourist information across all local government areas in the Chichibu region (Chichibu, Yokoze, Minano, Nagatoro, and Ogano).